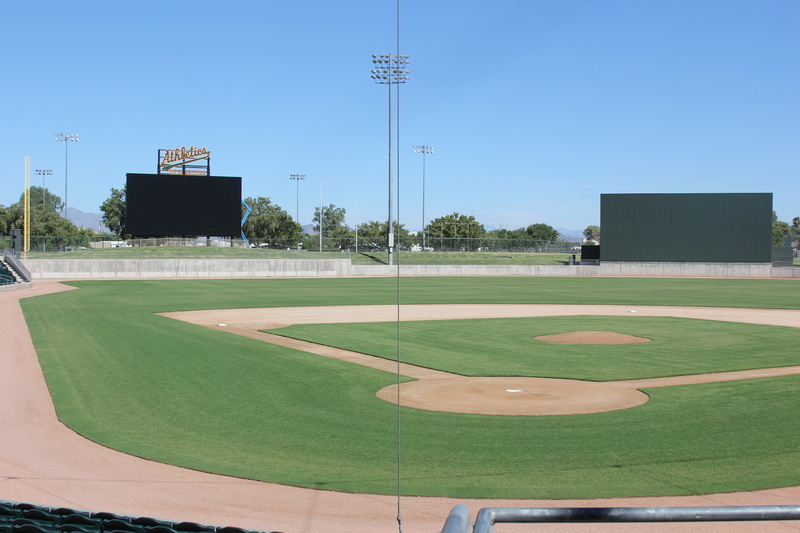 Mesa, AZ – A year-long project to extensively renovate Hohokam Stadium and the Fitch Park training facility to accommodate the Oakland Athletics is expected to be completed in December. The facilities will serve as the team’s spring training home beginning with the 2015 Cactus League season. City and team officials got a tour of the construction sites today along with members of the media. Improvements to Hohokam Stadium are immediately noticeable as the exterior and entrance gates are being painted and re-branded with the familiar Oakland Athletics green and gold color scheme. The stadium is also getting refurbished seating, a state-of-the art scoreboard and a new and expanded clubhouse. The bleachers along the left field and right field foul lines are being replaced with party decks. The City of Mesa and the Oakland Athletics reached a 20-year agreement in March 2013 to return to Mesa beginning in 2015. The team also holds two five-year options that could extend the contract to 30 years. The Athletics previously trained in Mesa from 1969 to 1978, winning three consecutive World Series from 1972 to 1974. With the Chicago Cubs new training facilities at Riverview Park, Mesa will now host two spring training teams with updated and new stadiums, making it a premiere destination for Cactus League spring training baseball.